Today, millions of be-ghouled kids across North America will be facing the disappointment of “fun size” candy as they trick-or-treat for Halloween. While “fun size” may sour any ghost or goblin, candy makes for a quite the sweet and surprising etymology. 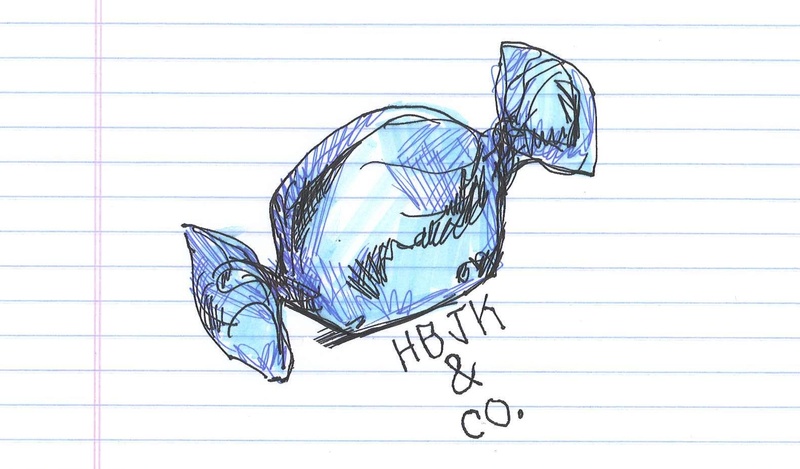 “Candy.” Doodle & secret message by @andrescalo. Following in the tradition of the Romance languages, the earliest appearance of candy is in sugar-candy in 1390. From the French (sucre candi) and, previously, Latin (saccharum candi), we can unwrap the Arabic qand, “the crystallized juice of the sugar-cane” (Oxford English Dictionary [OED]). Passing through to Arabic from Persian, the word is connected to the Sanskrit khanda (“piece,” as in “piece of candy”), from the verb khand “to break.” (I think of small chunks of brittle as a visual reference, for whatever it’s worth.) The Online Etymology Dictionary proposes a Tamil root for “to harden.” Tamil, you may recall in my second post on “citrus,” is a Dravidian language, found in southern India and Sri Lanka. Now that’s quite the Halloween haul. Both sugar and cane also go back to the cradle of civilization, if you will, teaching us how ancient the “sweet-tooth” really is, to riff on Jordan Shipley’s commentary on these words. With both passing into English via the sturdy stock of French, Latin, and Greek, the former we can trace back to the Arabic sukkar (“sugar”), which has been connected to a Sanskrit word for “grit,” as in “ground-up,” like, well, grains of sugar. The historical phonology of sugar is quite ghoulish, however. The latter, cane, is via a Semitic root, qanah, “reed,” which itself some link to the Sumerian gin, meaning the same. This root may also be part of the origin of caramel, along with the Indo-European root for “honey.” Canyon, canal, canister, cannon, and canon all, to various degrees, may be related to cane. I know this holiday isn’t even over, but I have to put out one yuletide decoration briefly: A candy cane may evoke Christmas, which, culturally speaking, is about as Christian and Western as it gets, but etymologically, we can see that candy cane comes from a whole different world. Now that’s quite the treat, isn’t? Seize away, ghoul, as long as you don’t steal my candy. Ebola, Islamic State, European economic wobbles, public shootings, midterm election campaign advertisements–don’t panic, but we’re not out of the woods yet. Nor are we ever with panic, if we consider its etymology. Today, we might think of panic as a kind of fear, but originally it characterized fear: sudden, wild fear was called panic fear. In its earliest uses before 1586, panic directly described an association with the Greek god Pan, and it is indeed this self-same deity that so induced the English panic. According to the Oxford Classical Dictionary (OCD), the idyllic, Ancient Greek region of Arcadia was the domain of Pan, a half-goat, half-man shepherd god and son of Hermes always seen with his syrinx (the eponymous pan pipes and source of the word syringe) and lagobolon (a stick used to strike hares). To the OED’s description, the OCD adds: “From the Hellenistic period onwards, Pan is the god responsible for sowing panic in the enemy, a sudden, unforeseeable fear.” I’d certainly panic, though, if I encountered a goat-man. Atop Arcadian’s Mount Lykaion, a site of great religious and cultural significance, Pan’s name is attested as Πάονι (Paoni), “certainly derived from the root *pa(s), and means ‘guardian of the flocks’ (cf. Latin pascere)” (OCD). The Proto-Indo-European *pa- means “to protect” or “feed,” and nourished quite a few important derivatives: the English food, feed, and fodder; the French-based foray and fur, among others; and the Latin pastor, pasture, and Romance root for “bread,” panis, source of companion and company. Many of my sources, though, connect Pan to the Sanskrit Pusan, which Klein describes as a “Vedic god, guardian and multiplier of cattle and of human possessions.” Indeed, Skeat posits a connection to the Sanskrit pa, “to cherish” or “to nourish.” In this light, there seems to be little to panic about in panic. An economic panic (like the Panic of 1837) is attested in 1757. If you recall my post on monger, panicmonger goes back to 1845, I believe in reference to what became the Great Famine. Panic button is cited in 1948 from U.S. Air Force Slang: “a button or switch for operating a device in an emergency,” presumably some sort of alarm or eject button. Panic attack is properly attested in 1966, though the sense of it came earlier. The ancients certainly weren’t deaf to puns. Pan’s name was associated with the Greek παν, meaning “all.” Due to this association,the Romans adapted Pan as Faunus (hence fauna), as “a universal god, the All” (OCD). Today, we see pan as prefix: “Pan-American” or “pandemic,” for example. We also see it in panoply (Greek, “all arms,” referring to a full suit of armor), panacea (Greek, “all-healing”), and pandemonium (coined by John Milton as the the capital of hell). Pamphlet, too, contains pan: It comes from a Greek name, Pamphilos (Πάμϕιλος, “loved by all”). Rendered as Pamphilus in Latin, the name was used in a short, very popular, and widely circulated 12th-century amatory poem. Some really see pan everywhere. Jordan Shipley sees it in the banjo, a “slave pronunciation” (OED) of bandore, a lute-like instrument rooted ultimately rooted in the Greek πανδοῦρα (pandoura). The Greek refers a three-stringed instrument and also gives us the word mandolin. The banjo itself is from Africa. 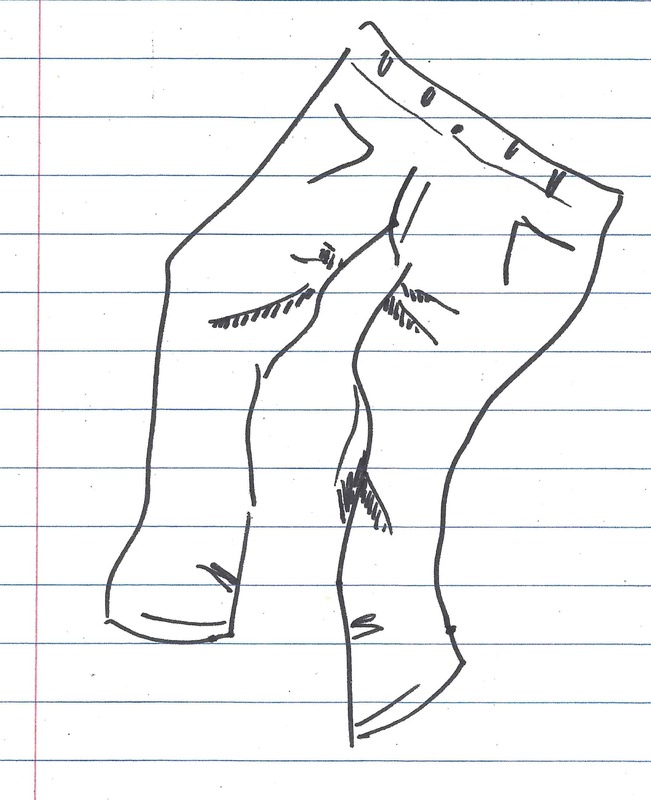 Shipley also sees it in pants: Drawing on Klein’s work, “St. Pantaleone: all lion, a Roman physician (d. A.D. 305), became the old buffoon Pantaloon in commedia dell’arte; from his costume, pantaloons, shorted to pants…” San Pantaleone was a Venetian patron saint and Pantaleone became a popular male name. I, for one, think Pan would have been way less scary had he a proper pair of pants. So often, we don’t hear about protocols until they’ve been breached, as in recent efforts to control Ebola in the United States. It turns out, though, that protocols really may be the “glue” that holds it all together. If we follow protocol back to its roots, we get a Greek expression for “first glued on”: protokollon, or πρωτόκολλον, a manuscript technology that was all about authorship and authenticity. [Protocol] meant, in Byzantine authors, orig. the first leaf glued on to MSS., in order to register under whose administration, and by whom the MS. was written; it was afterwards particularly applied to documents drawn up by notaries, because, by a decree of Justinian, such documents were always to be accompanied by such a first leaf or fly-leaf. It meant ‘first glued-on,’ i.e., glued on at the beginning. The Oxford English Dictionary (OED) is helpful for its clarity here: The “first leaf of a papyrus-roll, bearing the official authentication and date of manufacture of the papyrus.” If you’ve ever flipped through the front matter of a book to assemble your “Works Cited,” you’ll see that the tradition continues. The word was rolled out into Latin, then French, where it took on senses of a “draft” of a document, a proto-table of contents, or, like docket, the “minutes” of a meeting. Specialized meanings–written formulas used in drawing up church documents, special provisions and etiquette in diplomatic proceedings, records of medical and scientific procedures–eventually propelled it as the “accepted or established code of behaviour” (OED) by 1915. Speaking of which, though your teacher will tell you not to eat your paste or glue, you kind of already are. 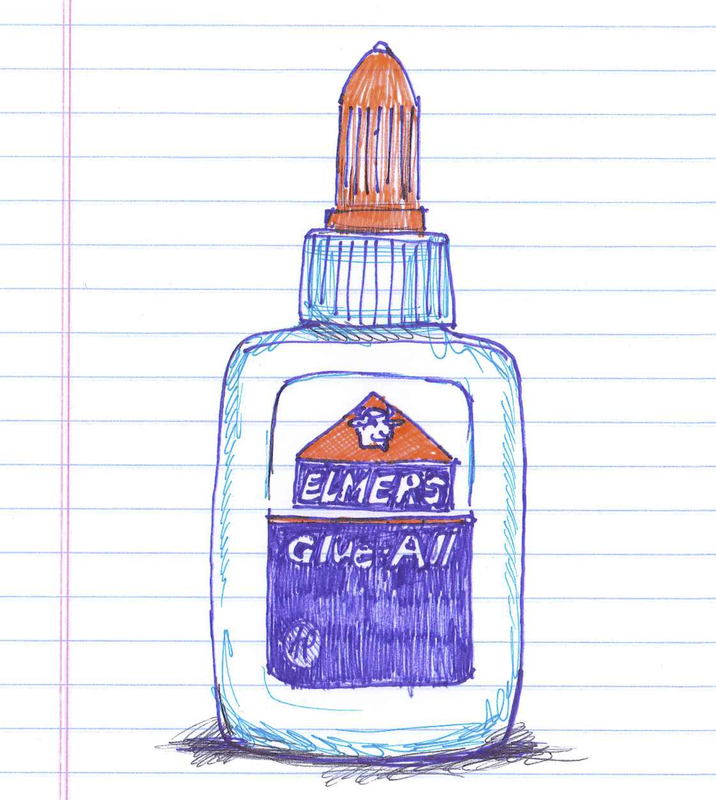 Glue is from the Latin gluten, in wheat, rye, and barley products, though we might all now know it best by its absence. And paste originally referred to kneaded, moistened flour (Oxford Dictionary of English Etymology)–hence its close relationship to words like paste and pastry. As for the deeper origins of kolla, I have found nothing certain. I wonder if it may be a regional term for tree tar or plant gum, which were used in some of the earliest glue technologies. But whatever the origin of kolla, “glue” turns out to be instructive: Some meanings of words stick while others fall off, making the history of a word quite the collage. When things get “hairy,” U.S. Presidents like to appoint czars. Presently, Obama is considering an Ebola czar, but the executive branch post is said to date back to Woodrow Wilson, who appointed an industry czar during World War I. The term, of course, refers to no official title; it has served as a media shorthand for these particular policy coordinators. Most famous perhaps is Nixon’s drug czar. Among many others, FDR had his rubber czar, LBJ his poverty czar, Clinton his AIDS czar, Bush his terrorism czar–the list truly goes on. The original Caesar, of course, refers to Julius Caesar. In Ancient Rome, Caesar was his “cognomen,” initially a nickname that evolved into a hereditary addition. The original meaning of Caesar is as lost as his empire, but there is a tradition that it was taken from caesaries, “long, flowing hair,” (Traupman) either due to the fact that Caesar was born with a full head of hair or that his family line was, as was the man himself, prone to balding. Others argue that the root of the name is from the past participle form of the Latin verb “to cut,” caesus, referring to the legend that the future emperor was “cut out” from his mother’s womb. Today, a C-section, or Caesarian section is reputedly so derived from the legend–though improbable, as it would have been lethal to the very mother that was alive well into the height of Caesar’s power. And the Caesar in Caesar Salad is named for one, Caesar Cardini, whose given credit for his eponymous dish–concocted, perhaps surprisingly, in Tijuana. The United States Supreme Court recently began its new term. The first item on its docket has been deciding the cases it will put on its docket. This docket, it turns out, is a low word in a high place–etymologically, that is. In the 15th century, a docket was a “summary,” much like the minutes of a meeting–and quite the royal one, if we consider the first appearance of the word as doggette in 1483. Over the next 100 years, it signified an “abstract,” especially for contents of letters patent. By the 17th century, we have evidence for docket‘s use as a memorandum for legal judgements in Samuel Pepys’ famed Diary, an important primary source for the period of the English Restoration–and, for lexicographers, the language of the time. Yet it is by 1790 that we arrive at its usage most familiar to American English ears, namely, a list of cases for trials, spelled, though, as docquet. Of course, a docket lives on today in British English as a label listing out the contents of a package or delivery. And outside of the courts, American speakers may speak of dockets as their to-do lists. I think we can easily see the legal tale of docket, and thanks to the Oxford English Dictionary (OED) for it. But its etymology tells a very different kind of tale: quite literally, a horse’s tail. Or what remains of it. Ultimately, etymologists cannot speak to the origin of docket with any final certainty. However, many converge on the same possibility: The core of docket is comprised of dock, in the sense of the “solid fleshy part of a horse’s tail” (OED). In particular, a dock–and its derivate verb “to cut off” or “curtail”–was the remaining stump when a tail was cut short, especially a horse’s tail, to ensure it did not catch in a harness. 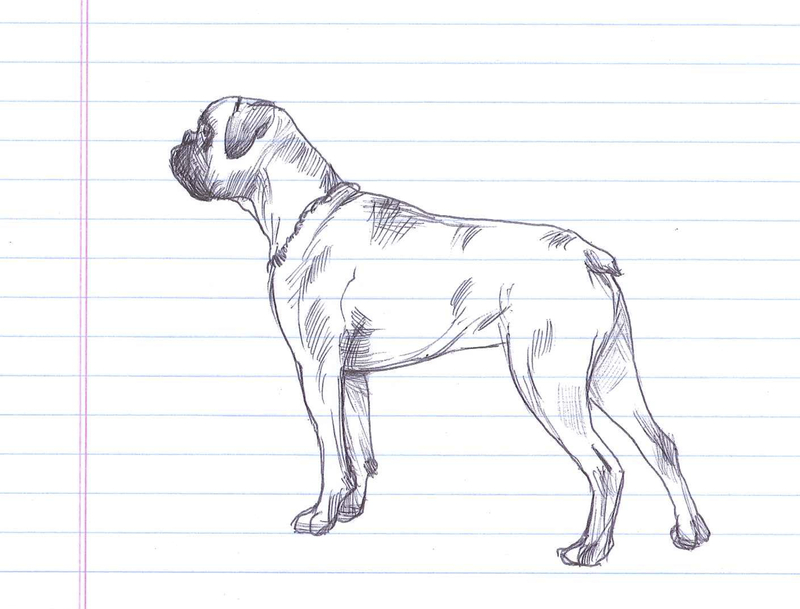 This practice is perhaps most familiar–and controversial–today with respect to dogs like Boxers. This dock–dok, in its earliest form around 1400–is probably from a common Germanic root, which the Oxford Dictionary of English Etymology proposes means “something round” or a “bundle.” Various Germanic languages use the root to refer to “dolls” and “girls.” I suppose we should imagine a doll as a small bundle, perhaps swaddled in clothes or a blanket, or perhaps as made of straw. To dock someone’s pay is attested in 1822 and is so derived. With dock clipped off, what of docket’s –et? It may be a variation on -ed, which forms the past tense and past participial forms of regular English verbs, and whose sound (and spelling) will vary depending on its environment. Or it could be a visitor we’ve seen around these parts quite a bit recently (cf. target, gobbet, and, in its Italian cousin, rocket): the French diminutive -et. This form is used for masculine nouns in French and is featured in not a few everyday words. As in your new iPhone 6, whose tablet-like size renders your pocket useless. The feminine form is probably more recognizably French: -ette, like baguette. You may know its Italian counterpart in bruschetta or libretto, its Spanish iteration in señorita or Juanito. The diminutive suffix surfaces, too, in Ernest Weekley’s alternative etymology of docket, which, according to my research, stands alone. He jumps off from the earliest attestation of doggette, seeing in it the Italian doghetta, a “bendlet in heraldry,” half the width of a so-called diagonal band on a shield. This doghetta, Weekley continues, is a diminutive of doga, a “cask stave.” He points us to label (also originating in heraldry as a kind of strip) and schedule (going back to strips of paper used in ancient Rome) for the sense evolution. A cask stave, then, supposedly resembles a heraldic band that evokes a strip of paper on which one would have recorded a docket. Dock may make a stronger case than doga, but some word origins will never meet with final judgment. The word job has a big job in our language. Primary school teachers reinforce their pupils with “Good job!” stickers on homework assignments. When we meet somebody new, jobs are among our first questions. And monthly jobs reports have the power to shift political landscapes. We land first jobs, which are often summer jobs. Told not quit our day jobs, we work odd jobs as we strive for dream jobs. We fill out job applications, read job descriptions, try to improve job satisfaction, and hope for job security. We fall prey to inside jobs or want our money back for hack jobs. We envy those with cushy jobs. We run from nut jobs and whack jobs who’ve just carried out bank jobs. We get nose jobs. Behind the bedroom door–well, I didn’t expect this introduction to be, um, a dirty job. Our jobs put food in our mouths–and, etymologically, it turns out job may be even closer to our mouths than we might suspect. In spite of its big role in our lexicon and lives, job has a humble history. The deeper origin is ultimately unknown, but the word may well be related to gob, which you probably best recognize in the plural, e.g., gobs of money. This gob has been working since the 14th century, meaning a “piece,” “lump,” or “mass.” And it was also put to work as a “cartload” in the 1600s. 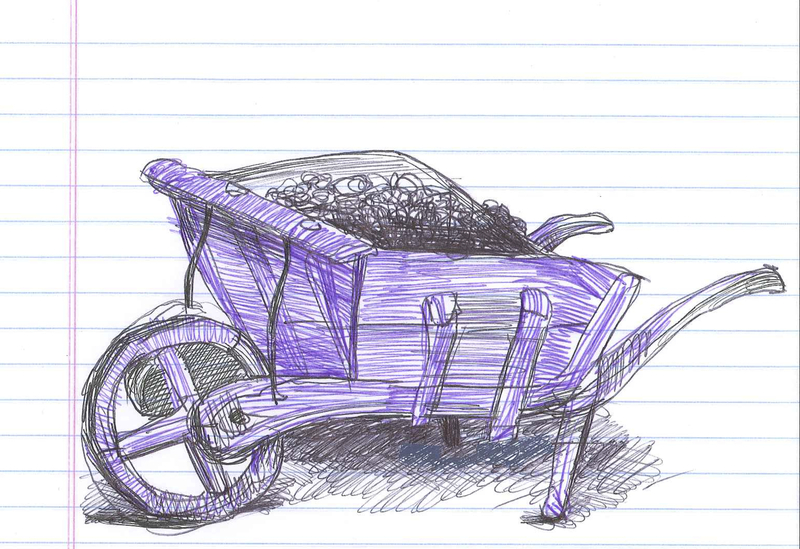 Perhaps you can imagine a worker hauling some mound of material–perhaps stone or straw or whatever it is piled up in that preceding doodle–one load at a time until the job is done. Indeed, Walter Skeat cites the expression “to work by the gob.” Perhaps our equivalent today would be a task or a project. By the 17th century, job was moving up the ladder, starting to signify work one has to do as part of his or her occupation. By the 19th century, job was referring to one’s actual position of employment. Gob comes from the French gobe or goube, referring to a “mouthful.” The word, in turn, is from the verb gober, “to swallow” or “gulp.” Some dictionaries even gloss gober as “gobble,” which is most likely related as a frequentative form of gob with imitative influence, like a turkey’s gobble. Gobbet (also a “lump,” though more specifically “a piece of raw flesh”) is related, too; it’s considered a diminutive of gobe. We saw this diminutive, which takes the form -et, in target. Other French borrowings like budget, bullet, and pocket feature it. A goblet, which we brought to our more medieval mouths for gulping, is so descended as well. Scottish and Northern English speakers gobbled up this Celtic-based root with a sense of humor, taking up gob as jocular term for “mouth,” as in a gobstopper. Do all these connections leave you a bit gobsmacked? Yep, the British expression means “smacked in the gob,” or “mouth.” Or perhaps you’ve shown the patience of Job in getting to the end? OK, that Job is completely unrelated. In either case, I think I’ve done my job here. But one number you may not realizing you are hearing is 40–an etymological 40, that is. 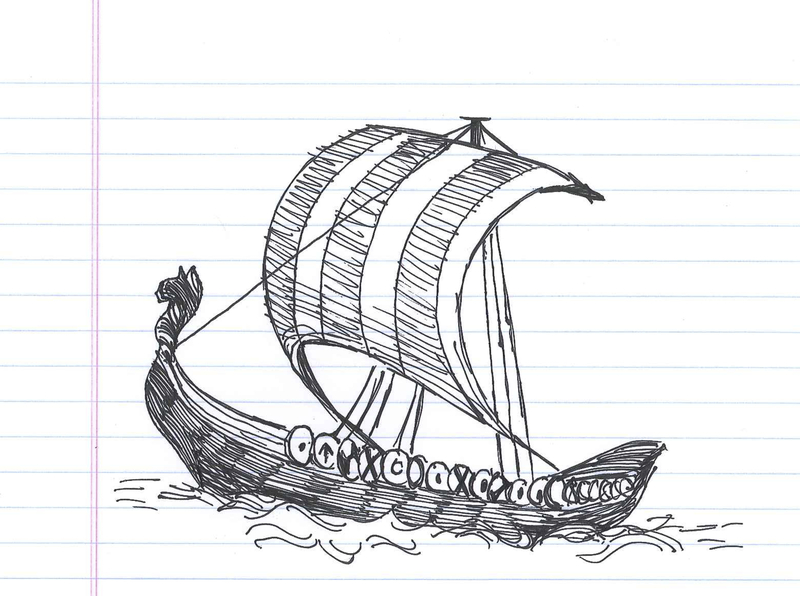 “Seafaring vessel.” Doodle by @andrescalo. Quarantine is ultimately from quadraginta, the Latin word for “forty.” But there is more than one “forty” to this story. It was applied first, in all likelihood, to the forty day period of Lent; for which the term ‘quadragesima,’ fortieth, has been substituted. Then it was applied to the forty day period in which a widow might remain in the home of her late husband, before relinquishing to the heir. Finally, it was applied to the forty days during which a ship from an infected port, or bearing infection, must wait before landing. These first two meanings of quarantine are considered to have been taken directly from reduced Medieval Latin forms of quadraginta. The third sense of quarantine, from which we get today’s sense of medical isolation, was “first imposed in 1377 at Ragusa (now Dubrovnik), on ships from Egypt and the East,” Shipley comments in his Discursive Dictionary. Other sources cite quarantine as first appearing in Venice. This quarantine indeed passes, though, from the Italian quarantina giorni, “period of forty days,” with quarantina from quaranta, “forty,” also showing significant reduction of quadraginta‘s consonants. The Latin quadraginta is tallied up from quattuor, “four,” and -ginta, “ten times.” Quattuor is turn from the Proto-Indo-European *kwetwer- (“four”), which also gives English four. And the numerical suffix -ginta is from *dekm, responsible for the –ty in in forty (Old English –tig, “group of ten”) and other cardinal numbers. In Old English, forty was feowertig, essentially equivalent to the Latin quadraginta. You are probably familiar with the spiritual numerology of forty, particularly in Abrahamic traditions. To name a mere few: Forty days and forty nights of rain caused the Flood in the Old Testament. Jesus fasted in the desert for forty days. The Prophet Muhammed was said to be forty years old when visited by the archangel Gabriel. [T]he number 40 must have been used very frequently by Mesha’s scribe as a round number. It is probably often used in that way in the Bible where it is remarkably frequent, esp. in reference to periods of days or years. … How it came to be so used is not quite certain, but it may have originated, partly at any rate, in the idea that 40 years constituted a generation or the period at the end of which a man attains maturity, an idea common, it would seem, to the Greeks, the Israelites, and the Arabs. Let’s just hope that we don’t need forty days and forty nights of these current quarantines.